Donald Trump’s vote fraud investigation will finish what the GOP started. The president’s bogus claims will give Republicans the cover they need to ramp up voter suppression nationwide. 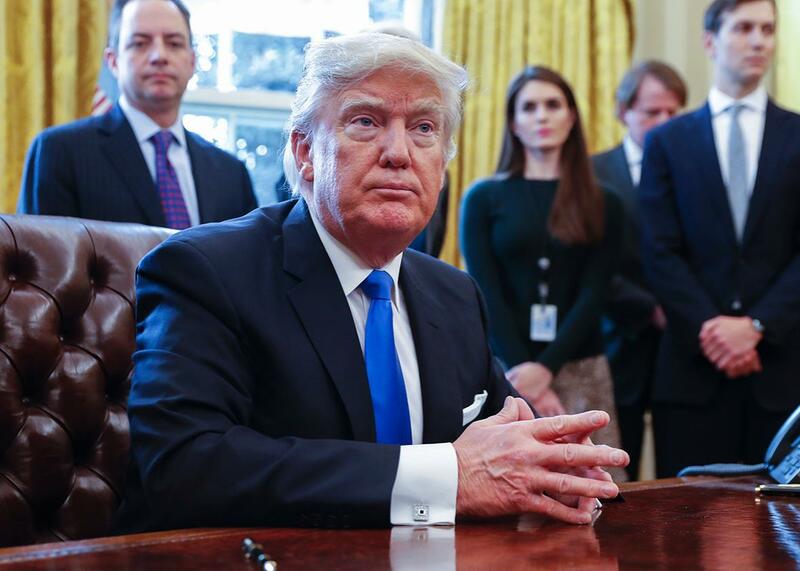 President Donald Trump looks on after signing one of five executive orders in the Oval Office of the White House on Tuesday in Washington. On Wednesday morning, Donald Trump tweeted that he “will be asking for a major investigation into VOTER FRAUD, including those registered to vote in two states, those who are illegal and … even, those registered to vote who are dead (and many for a long time). Depending on results, we will strengthen up voting procedures!” The Washington Post’s Robert Costa reports that Trump’s obsession with nonexistent fraud is the result of his insecurity over losing the popular vote by a wide margin, and that his fixation isn’t being encouraged by GOP congressional leaders or even by his own staff. But that won’t stop Trump from ordering his Department of Justice to investigate the supposed perfidy of the American electorate. In his press briefing on Wednesday, Sean Spicer indicated that such an investigation would likely target “bigger states” like California and New York. This investigation is notable for three reasons. First, it is the direct result of years of Republican lies about the prevalence of voter fraud, which created a counterfactual hysteria that the party’s leadership is now apparently unable to temper. Second, it will primarily serve as pretext for an assault on voting rights at both the state and federal level. Third, it will not turn up any significant evidence of fraud—and this lack of evidence will not matter. Having invented the myth of voter fraud, Trump and the Republican Party will continue to perpetuate it no matter how many times it has been debunked. The current wave of voter-fraud hysteria began during the George W. Bush administration in response to the unnervingly close 2000 presidential election. Republicans recognized that the GOP would benefit from laws purportedly designed to protect the integrity of the vote, since in practice, they would limit Democrats’ access to the ballot. Conservative states were eager to pass draconian voter ID measures, which disproportionately burden minorities and low-income voters, who tend to support left-leaning candidates. To provide these states with the pretext for such measures, Bush ordered the Justice Department to conduct a Trump-esque voter-fraud investigation, firing United States attorneys who couldn’t find enough fraudulent voters to prosecute. Trump’s efforts to “strengthen up voting procedures” will probably look a lot like the rules enacted in Texas and North Carolina. And once he appoints a new Supreme Court justice, a majority of the court will affirm the legality of stringent voting restrictions. (Four members, including Justice Anthony Kennedy, were willing to let that openly racist North Carolina law take effect this election cycle; the court’s 4-4 deadlock meant the law could not be implemented in advance of the 2016 election.) House Speaker Paul Ryan has previously endorsed requiring voters to provide “proof of identity and citizenship” to “make sure that legal votes are not cancelled out by illegal votes.” That would entail forcing voters to show not just a state ID, but also a passport or birth certificate—something three states have already tried to do. Those laws were blocked in court because they conflict with the current, more lenient federal requirements. But congressional Republicans, with Trump’s help, can easily alter those requirements, forcing all voters to show proof of citizenship in all federal elections. Trump’s DOJ can also decline to intervene when states purge voters from the rolls, which conservative states already do quite often, frequently without notifying the purged voters. Indeed, shortly before the 2016 election, Republican activists helped to illegally purge thousands of voters, mostly black Democrats, from North Carolina’s voter rolls. Obama’s Justice Department intervened and a judge ultimately reversed the purges, labeling it “insane” Jim Crow–style suppression. The odds that Trump’s DOJ would intervene in similar circumstances are close to zero. In fact, it might well side with the states doing the purging. How will the public respond to this disenfranchisement? It largely depends on how the government frames its findings—and Trump has already begun moving the goalposts. Although Trump is launching this investigation on the unsubstantiated theory that millions of ballots were cast illegally, his tweets suggested a different focus: outdated voter rolls. This strategy is very clever, because the investigation will no doubt turn up evidence that many state voter rolls are outdated. That, on its own, is not a serious problem: The inclusion of a dead person’s name on a voter roll doesn’t much matter unless someone votes under that dead person’s name. But by conflating actual fraud with outdated voter rolls, Trump can create the impression that his investigation bore fruit. Trump’s prevarications will take on the weight of truth through sheer repetition—or at least give the false sense that there is a legitimate debate here, and two sides to the story. That gives Republicans more than enough cover to move forward with their purges and suppression. Ryan and his allies may not believe Trump’s claim that the popular vote was somehow stolen, but they’ll happily use his paranoia to drum up support for voter suppression. Before the election, it seemed the war on voting rights was finally reaching its end. Now it appears that the assault on suffrage has only just begun.